Below are common attributes associated to Blackie Sweet Potato Vine. Become a care taker for Blackie Sweet Potato Vine! Below are member comments regarding how to plant Blackie Sweet Potato Vine. No comments have been posted regarding how to plant Blackie Sweet Potato Vine. Be the first! Do you know how to plant Blackie Sweet Potato Vine? Below are member comments regarding how to prune Blackie Sweet Potato Vine. No comments have been posted regarding how to prune Blackie Sweet Potato Vine. Be the first! Do you know how to prune Blackie Sweet Potato Vine? Below are member comments regarding how to fertilize Blackie Sweet Potato Vine. No comments have been posted regarding how to fertilize Blackie Sweet Potato Vine. Be the first! Do you know how to fertlize and water Blackie Sweet Potato Vine? Below are member comments regarding how to deal with Blackie Sweet Potato Vine's pests and problems. No comments have been posted regarding how to deal with Blackie Sweet Potato Vine's pests and problems. Be the first! Do you know how to deal with pests and problems with Blackie Sweet Potato Vine? 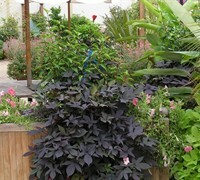 Looking for Blackie Sweet Potato Vine? Blackie Sweet Potato Vine is grown mainly for its beautiful purple/black foliage but may bloom intermittently through the summer months. The light pink flowers with purple centers are normally hidden beneath the foliage.